Art is not just for museums and galleries. Trine 2 follows the story of three - the wizard Amadeus, the knight Pontius and the thief Zoya - in a world full of magic, mythical creatures and intriguing puzzles. Set shortly after the previous installment, the mysterious artefact known as Trine returns, and it’s up to our three protagonists to step up to the plate and embark upon a new and mysterious mission. Keeping all the elements that established the original as one of the best independant productions of all time was a major focal point for me personally and I was pleasantly surprised that the tidy controls and intuitive game mechanics are all here in spades. The combination of each heroes unique abilities in solving each and every puzzle is a welcomed one and everything moves at a steady enough pace that it never feels tired. Although the first Trine was already a beautiful game, the second adventure delivers even more visually amazing effects. The exquisite art direction results in extremely colorful scenarios and little nuiances that will make you stop several times just to see take in what’s around you. It's worth mentioning the lighting effects, which help to give a unique climate for each of the places through which you pass. Details like the sunlight reflecting off Pontius’s armor and shield and how dark environments help the characters and ‘hide’ them in time of need are proof that Frozenbyte was determined to make the most beautiful game possible. The audio is also notable, featuring voice work with a surprising quality. The songs closely resemble those found in older cartoons, giving a medieval and modern tone blend. The skills that are available to you remain the same - Pontius, the knight, is favored in combat and can use his shield to defend against enemies that spit poison, fire, or darting guns and many scenario elements. The stout knight is always faithful to the defense of his kingdom and has as his main skill force the use of his sword and hammer. Zoya, the Thief - who never likes to be called that by the narrator - has abow and special arrows that freeze or blow up enemies and weak structures. In addition, a hook, which helps to hang and swing off of various objects in order to reach hidden areas and high levels. Amadeus, the Wizard, can use his magical powers to create boxes and platforms to levitate items. The lanky magician really comes in hand in a tight spot with his array of abilities and his bridge building power is a particularly useful addition to his armory. 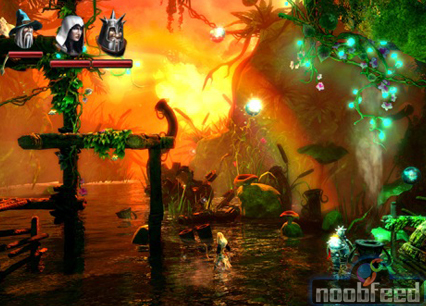 Trine 2 requires good observation skills in each scenario, with some seemingly insurmountable obstacles requiring a prolonged thought process to work through successfully. It also requires a fair amount of skill. For example, early in the game, you have to correctly move trunks to carry water to a seed, and soon after, you need to shoot an arrow to shoot down a fruit attracting the attention of a giant frog. It is a little like tapping your head and rubbing your belly at the same time. 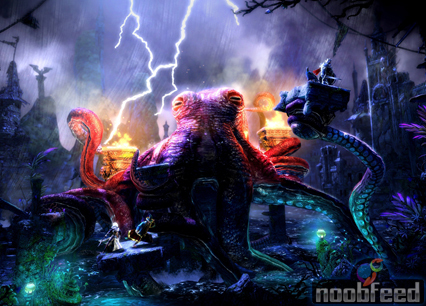 While Trine 2 is not exactly an easy game - especially on the higher difficulties - some changes made by the development team make the process of getting through the game much smoother than the previous version. The first change in this direction was the removal of the magic bar, which allows you to make as many boxes as you like and levitate them at will, or use the invisibility of the thief without any boundaries or restrictions. The result is a more accessible game, but one that has lost much of its strategic hand. 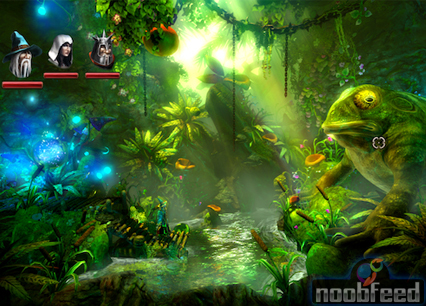 One of the main complaints related to the original Trine was the inability to play with others over the internet, something that has been properly resolved as a result. As in local matches between multiple players, in online multiplayer each person assumes the role of a hero and a system "drop in / drop out" prevents the match being interrupted if a participant enters or leaves the lobby during the adventure. Those who fondly remember the evolution system from the original will be sad to hear that it’s been reformed, now allowing you to redistribute points earned in each stage without any sort of planning whatsoever. This makes the unlockable skills somewhat of a formality and this is an aspect of the game that they should have left be, instead of sacrificing it for the sake of accesibility. The story also comes up a tad short, only providing the bare basics to move you from point A to point B. It's hard to care about the motivations and problems of any minor character - a task that becomes even more unpleasant when one realizes that the ultimate goal is simply to rescue a princess. Trine 2 is a superb game make no mistake, but while there are areas that shine bold and bright, small defects are forgotten and swept under the carpet so to speak. The extremely high production values do make the whole package a lot more tolerable though – with refined gameplay and stunning graphics worthy of AAA certification - and because of that it verges on the edge of must-buy status. For fans of the original, or the average joe looking for an unconventional experience then this is right up your street. It’s also a nice showpiece to show friends and family – especially those who don’t believe video games qualify as a recognised art form. Forget the gameplay features, the game looks so pleasing on the eyes.